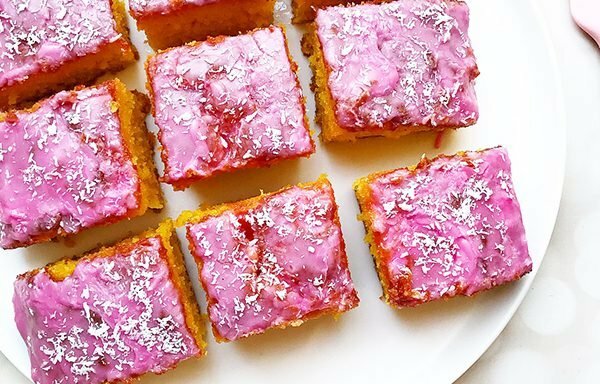 Why is the Tottenham Cake pink? Spurs are a classic blue, my mind cannot fathom!!! Using grease proof paper, butter and line a brownie or square tin. Adding all the wet ingredients first, using an electric mixer combine butter and sugar. Once creamed, add eggs and whip until fluffy for approximately 3 minutes. next, add the vanilla bean paste and milk and whisk one last time for 1 minute. Sift and add plain flour and baking powder and using a baking spatula fold in the flour gently, using a figure 0f 8 motion. Add coconut and gently stir it in. Pour the mixture into a buttered and lined brownie tin. Bake cake for 25 mins, ensuring it is not overbaked and a toothpick comes out clean. To ensure the cake does not dry out whilst cooling down, spray the cake with a sugar syrup and keep cake well covered. In a clean nd dry bowl, sift the icing sugar and add in your preferred liquid water or milk. use a mini whisk to ensure you get no lumps. Heres the fun part. Using 1 drop at a time, add pink food colouring. You decide which shade of pink you want. After each drop mix the icing to see which shade you like the best. Top this beautiful icing all over the top part of the cake and optional extra is to sprinkle desiccated coconut on top. Gently slice the cake into 9 or 12 and enjoy. 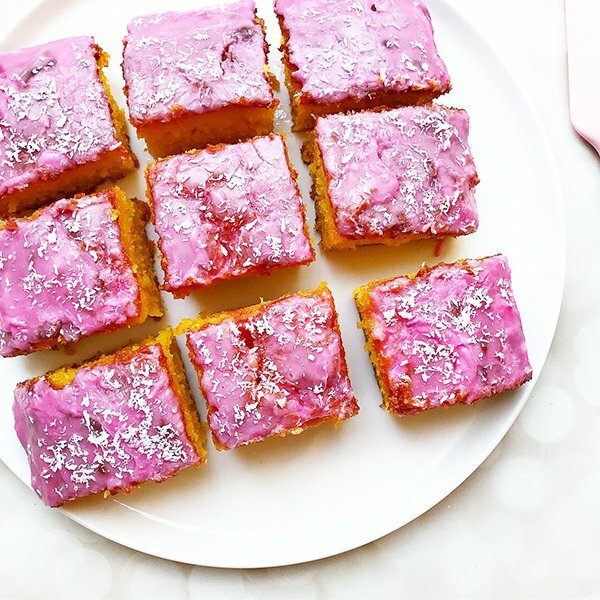 According to @bakewithmeblog, who quoted from a Tottenham Hotspur fan site, the Tottenham Cake derives from baker Henry Chalkley who originally sold these pink spongy squares at the price of one old penny and smaller odd-shaped pieces were sold for half a penny. So why the pink icing? Well, the pink icing is thought to have come from the mulberries which were found growing at the Tottenham Friends burial ground. Although not directly linked with the football team, it is suggested by Ted Willis that in 1901, the Tottenham cake was given away for free (!) to local children to celebrate the Spurs’ FA Cup victory. Well there we have it. And here is my Tottenham Cake and it’s simply a vanilla sponge cake topped with pink icing. Some traditional Tottenham cakes like to decorate with desiccated coconut and well we all know I love coconut so there is never a surprise when i add coconut to my bakes. The exact same recipe can be used to bake the classic school dinner style jam and coconut sponge simply by replacing the icing with jam. And some of you may also be familiar with the Greggs version, which is also referred to as the London cake! Now this has got me thinking big time. Why London and why pink??? Well all i know is that their one is most definitely adorned with desiccated coconut. 2. Use organic eggs and butter as it gives the sponge a lovely dairy, yellowy colour and richer flavour. 3. The wet ingredients must always weigh the same as the dry ingredients. I like to use the 6663 method where you add 6oz of each butter, sugar and flour to 3 eggs, because the measurement of 1 egg is usually 2oz which is equivalent to 2oz of the other ingredients. This is a perfect guide for cooking small cakes for 1. 4. For safe baking always bake at a lower temperature for a longer period of time and use a timer/ alarm. 5. And finally to ensure you have a lovely moist sponge you must do two things: 1. spray a light syrup after baking and 2. keep the cake covered with a cake stand lid as to not let the cake dry out. 6. Play around with the food colouring and you can achieve all sorts of shades of pink! Wow! I just made this cake with my 8 year old and it smells amazing! Looking forward to eating it tonight at Ifthar,,,,Thank you HungryHijabi for making your recipes so easily available, on Insta stories and here, will be trying out the chicken lickin bbq wings soon Inshallah ?